Getting you comfortable . . . 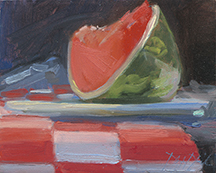 Learn to paint dynamic and exciting oils with ease. This really fun and informative workshop will cover the basic principles of oil painting and get you painting simple and easy to understand objects in a short time. The idea of this workshop is to get you comfortable with the process of painting while teaching you how to paint dynamic and exciting paintings. The class includes interesting and memorable discussions on all the basic elements of painting including, composition, massing, building form, light and shadow: and depending on your own style, knowing when a work is finished (learning how to not overwork your painting). Douglas delivers sound principles of painting that are an incredible foundation for your painting, and whether a person who has never ever picked up a brush, a relatively new painter or a more accomplished painter looking for some strong points to review, it will make sense. After the brief morning intro, a very hands-on approach to the class gets students organized and prepared to paint. Students will learn how to set up their palette with the basic colors and understand why this is helpful. Douglas will overview his palette and concepts that his work entails and do a subsequent demonstration painting throughout the next few days for each subject that the class paints. Sometimes the demo is a step by step and sometimes the demo is done first and remains as an example you can follow and reference. There is nothing to be afraid of or self conscious of and Douglas will get you through all the tricky parts and you will have fun. Students will work in their own style/technique so that the finished work is their own. Students will paint simple still lifes which usually includes items like apples, watermelon, eggs and really common and fun things. 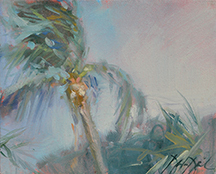 You will also paint from a photo so you get the idea of what painting “en plein air/out of doors” is like, usually we paint a palm tree, a beach and sometimes a sailboat. Depending on the skill level of each student, students are able to grow and develop at a rate that is to their comfort. Plan to produce a few small paintings and possibly one larger painting. Plan to bring notebook/sketchbook and enjoy all the demos along with some great stories to help you remember these principles that are the foundation of Douglas’ teaching. 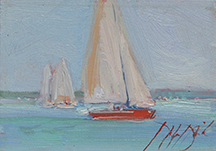 Douglas David has painted his way across the country, capturing the beauty and spirit of the things he loves - tranquil country landscapes, sunrises and sunsets on his favorite beaches, a simple pitcher of spring lilacs or peonies, a lemon, lime or a slice of watermelon on a checked tablecloth. Paintings that reflect comfort, warmth meaning and simplicity: similar to everything important to him - his close knit family, life-long friendships, creatively fulfilling work and giving his best. A recipient of numerous regional and national awards and honors, Douglas’ teaching is a way of giving back and sharing some of his journey with those who choose to study with him. For more detailed information, visit www.douglasdavid.com. Douglas will offer “BASIC PAINT KIT” which includes all the basic oils, brushes, palette knife, palette and canvas panels and medium for those who do not want to buy these supplies individually. You would need to bring some paper towels and rubber gloves. Price approximately $150., while supplies last. 1st hour: Welcome/Overview of Class & Terms. 2nd hour: Review Supplies and how to set up and get organized to paint, setting up the palette, and how to get started. Lunch: Brown bag or run to market close by to pick up a sandwich. Entire Afternoon: Paint in studio. All of second day: Paint in studio at your own pace on set ups Douglas arranges for you. Most of third day: Paint in studio at your own pace on set ups Douglas arranges for you. Last hour and half: Select and display various paintings accomplished / a small class show with discussions and summary by Douglas ends workshop on a very high note.